In this Oct. 21, 2018, file photo, the Perry Funeral Home on Trumbull Avenue in Detroit is pictured. Michigan regulators are seeking to revoke the licenses of the Detroit funeral home and its manager after the discovery of 63 fetuses in boxes and freezers last year. The Department of Licensing and Regulatory Affairs said Friday, Feb. 15, 2019, it completed an administrative investigation stemming from its inspection and shutdown of the Perry Funeral Home in October. Michigan regulators are seeking to revoke the licenses of a Detroit funeral home and its manager after discovering 63 fetuses in boxes and freezers last year. 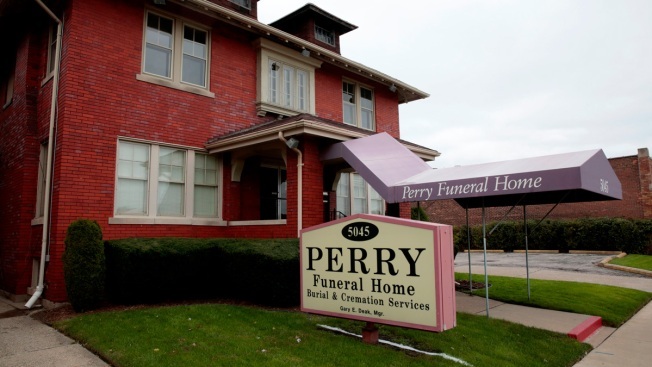 The Department of Licensing and Regulatory Affairs said Friday that it had completed an administrative investigation stemming from its inspection and shutdown of the Perry Funeral Home in October. The agency says it found "numerous acts" of gross negligence, incompetence, fraud and deceit in the practice of mortuary science. Among other things, the home is accused of filing 42 death certificates stating that remains were buried or stored at cemeteries when they were in the home's basement. The agency had already suspended the licenses of the home and its manger, Gary Deak. The Associated Press left a message Friday seeking comment from Deak.